Meet Paul Radosevich owner of V&K Honey, named after his two children Viktor & Katerina. V&K Honey supplies all the honey we use at the restaurant. 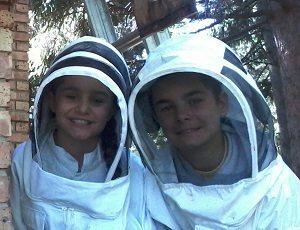 Paul’s interest in beekeeping began as a way to increase the pollination and production of his large family vegetable garden. 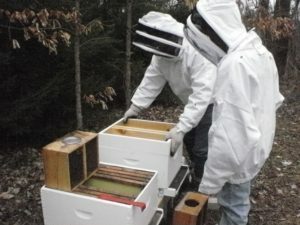 In 2013, after spending a summer working with an experienced beekeeper and researching books and YouTube, he started with two hives. By the end of the year he was up to twelve. 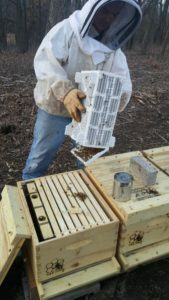 V&K Honey now has 170 hives across Kenosha, Racine, Walworth and Waukesha counties. Each hive may house 100,000 bees during the summer. The first question Paul is usually asked is “Do you get stung?”. His answer, “Yes”. While he may go weeks without a sting, one to two a day is not unusual and he’s gotten hundreds in one day. He says it only hurts for a few minutes, which is why he actually prefers bee stings to mosquito bites. The family collects approximately 60 pounds of honey from each hive between the end of July and into August. From that Paul makes beeswax candles and lip balm as well as bottled raw honey. Raw honey is only warmed to the temperature of the hive, 85-95 degrees, and then strained into bottles. Unlike commercial honey, raw honey still contains the natural enzymes and pollen that give the honey the depth of flavor we love. We currently use this raw honey in our Honey Vinaigrette salad dressing and drizzled over our Fresh Strawberries and Whipped Cream dessert and our Yogurt, Granola and Fruit on the Brunch menu. 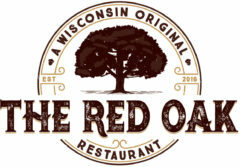 It’s also found its way into a few of our specialty cocktails, including our Red Oak Mimosa and our Killer Bee. We think you’ll appreciate the difference this locally sourced, minimally processed raw honey from V&K Honey makes. You can also find V&K Honey at the weekly Kenosha and East Troy farmer’s markets as well as one day markets and fairs in the area. Check out their Facebook page (@VandKHoney) and website (vankhoney.com) for more details.